safer and the tailpiece can resonate freely which is audible in the tone. The new suspension caused by tightening the strings causes the tailpiece to lie in the right plane, corresponding to the arch of the bridge. 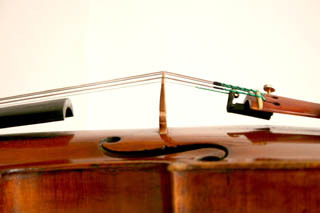 This way, the part of the strings behind the bridge falls into position equally. This is an essential condition for being able to adjust the playing action of the strings evenly.